When you’re seventeen every experience feels life changing – and then life goes on. 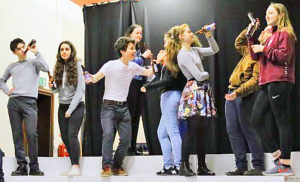 Taking a break from the classics, Barnstorm’s Kilkenny Youth Theatre presents their inaugural piece of devised theatre There is Only Now with a cast of 23 young people aged 13 to 18. There is Only Now features characters that everyone will recognise from their own school days; whether that was last week or fifty years ago. The lingo might have changed and the styles may be different, but the people remain the same. ‘There is Only Now’ runs from Thursday 12th to Saturday 14th of April at 8pm with a matinee on the Saturday at 3pm, in The Barn, Church Lane, Kilkenny (behind St. Canice’s Cathedral). Tickets are €12, or €10 concession. Book by calling 056 7751266 or email anna@barnstorm.ie. Please note that the play contains some strong language and deals with topics of interest to 13-18 yr. olds.